Happy Birthday to Cupcakes2Delite’s Top Commenter! Congratulations Wendy for being my top commenter on Cupcakes2Delite! Every time I receive a comment on my blog I get the same tingly excitement I had at Christmas as a kid wondering what was hidden in all the beautifully wrapped presents under the tree. Thanks Wendy for taking the time to leave all your comments on my blog….you are the Bees Knees! Another first for the year is your birthday you celebrated a few days ago and I wanted these birthday and thank you cupcakes to be a little different for you. 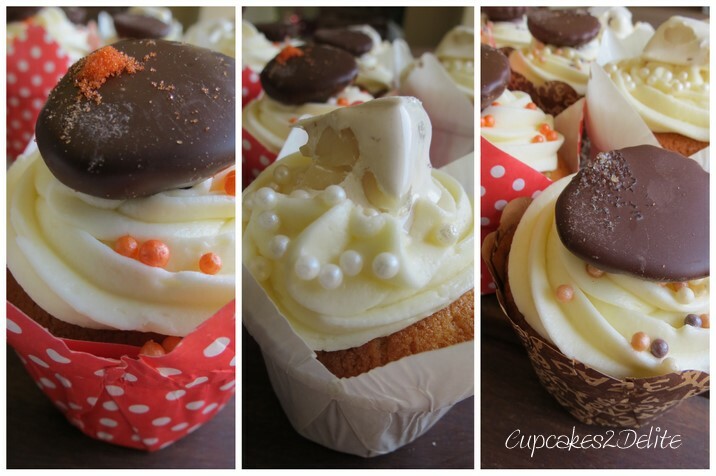 I made an orange cupcake with vanilla icing and finished off with an orange filled chocolate disc, the second flavour was a vanilla cupcake with a hidden nougat centre and vanilla icing and nougat to top it. The final flavour was a vanilla cupcake with a caramel syrup, vanilla icing and burnt caramel filled chocolate disc (thanks to Woolworths for their gorgeous chocolate products and nougat which inspired the flavours for these cupcakes). I hope you have as much fun eating these cupcakes Wendy as the fun I have reading all your quirky comments! Top commenter ….. not surprising – I am the one with the biggest mouth!!! I love reading your stories behind your beautiful cupcakes and your photos are just stunning as well. Furthermore this big mouth just LOVES your cupcakes and thanks so much for my birthday ones which I am savoring and eating slowly. I can tell you the nougat one was totally delicious …… going to try one of those burnt caramel ones with tea this afternoon………. Thanks Michelle – they were all stunning!! !